Before he became a household name as the heroic defender of Mafeking and founder of the Boy Scout movement. His main claim to fame was his definitive book on pig sticking and his penchant for skin tight riding breeches covered in pearl buttons. He also raised eyebrows with his outspoken views about the evils of prostitution, which hardly increased his popularity within a British Army that considered brothels essential for maintaining morale. 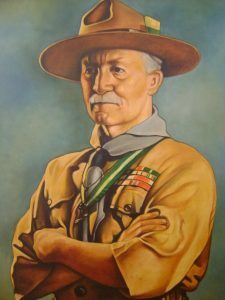 The movement was also a platform against the evils of masturbation, Baden Powell recommended that a young man beset by impure thoughts should place his “rascal organ” under a cold water tap. He also wrote “two men can be just as happy living together as any man and woman” Prophetic words because in 1912 at the age of 52 he finally married. His wife, Olive, was a formidable woman and heir to a large brewery. On their honeymoon he started to complain of “agonising headaches” They were cured when he left the marital bed and started to sleep on an open air balcony. Your article is spiffing, old bean. Would you enlighten us to why Baden Powel had such a penchant for boy’s coats?